Genuine OEM Epson Ink Cartridge Multipack, 840 page yield. 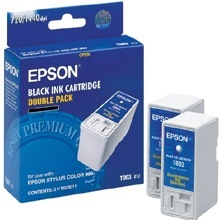 Multipack includes: two Black ink cartridges. Epson part number: T003012. Remanufactured Epson Ink Cartridge, Color, 570 page yield. Replaces Epson part number: T005011, T005. Remanufactured Epson Ink Cartridge, Black, 840 page yield. Replaces Epson part number: T003011, T003.